from all over the world that it would be unfair to sell such a book on a ‘first come’ basis. 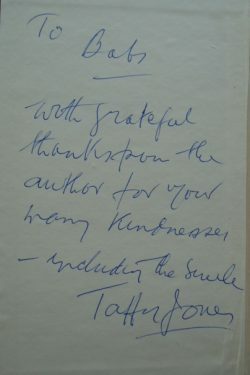 WH Allen First edition, first printing 1954. 295 pages plus lots of photographs including reproductions of 45 Cuthbert Orde portraits. Near Fine condition hardback book and Very Good condition dustjacket. A nice example of this book. The story of No.74 Squadron, R.A.F., one of the greatest fighter squadrons of all time which is virtually a history of aerial combat in both World Wars. This is a first-hand account of ‘Taffy’s’ life, first as a fighter pilot with the RFC during World War I, then life with the RAF during the inter-war years, and finally during Dunkirk and the Battle of Britain. Ira Jones was a 40 victory ace in WW1 and was involved in pilot training during WWII but managed to wangle a few operational Spitfire sorties too. James Ira Thomas “Taffy” Jones DSO MC DFC & Bar MM (1896 – 1960) was born near St. Clears, Carmarthenshire. In 1913, Jones enlisted in the Territorial Army, though he was soon transferred into the newly established Royal Flying Corps, serving as an air mechanic on ground duties (where he earned the Military Medal) before volunteering for flying duties as an Observer. Jones commenced pilot training in August 1917 after being commissioned. After completing his training he joined 74 Squadron. Throughout his service at 74 Squadron Jones won several awards and decorations; being awarded the Military Cross, the Distinguished Flying Cross and bar and the Distinguished Service Order. Although having a reputation for crashing his aircraft when attempting to land, Jones recorded 37 victories in just 3 months whilst flying the Royal Aircraft Factory S.E.5 during 1918. After the Armistice he became Commanding Officer of 74 Squadron until it was disbanded in 1919. After retiring in 1936, Jones was recommissioned after the outbreak of the Second World War, and flew briefly during the Battle of Britain. In July 1940, acting Wing Commander Jones was OC No. 7 Bombing and Gunnery School, RAF Porthcawl. It was here that one of his most famed actions occurred when, whilst flying an unarmed Hawker Henley near Swansea, he attacked a Junkers Ju 88 bomber with a Very pistol, a type of flare gun. His actions were enough to fight off the Junkers, which returned to its base. 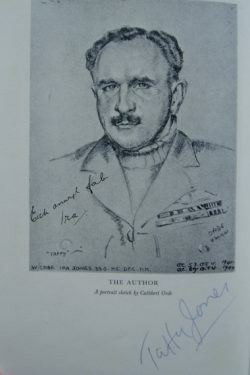 After retiring again at the end of the Second World War, Jones lived in Wales where he wrote three books on the RFC and RAF. He died in 1960 through complications after a fall at his home in Wales. 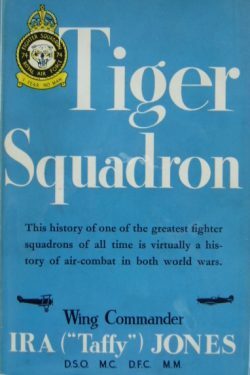 A mixture of auto-biography and first hand account of one of the RAF’s most famous fighter squadrons in two world wars. Plus a double signature of one of the top ranking RAF aces of WW1. A great signed book for any aviation library.